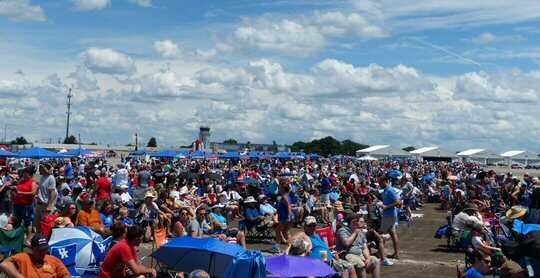 On Sunday, June 5, 2016 the sun finally arrived at The Great Tennessee Air Show. The popular Mid-Tenn attraction needed it after a week when tragedy struck the event and loomed over it like a sad black cloud. On Thursday, Pilot Marine Capt. Jeff Kuss was killed when his Blue Angels jet crashed at 3:01 p.m. near Smyrna Airport. This brought an unprecedented media spotlight as the world famous flight team pulled out leaving fans and organizers to grapple with whether or not the show should go on in light of the ill-fated accident. The Breitling Jet Team thrilled with their precision flying. 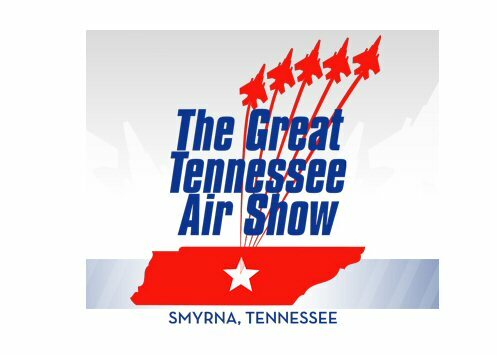 After substantial rain on Saturday the air show lifted into the sky with a new and profound purpose as the Great Tennessee Air Show co-producers, the Smyrna/Rutherford County Airport Authority and The Air Show Network, made the timely and thoughtful choice to jointly donate a portion of proceeds of all ticket sales to the Captain Jeff Kuss Family Fund. The Geico Skytypers swooped and soared for the air show aficionados. Sunday’s program was greeted with a warm and pleasant day as a steady breeze blew off the runway in the direction of the attendees. The atmosphere in the stands was a little low key and reserved at times with the week’s events still on everyone’s mind but the non-stop display above was exhilarating once flying began shortly after 12 p.m.
High above the thousands gathered on the ground flew a Blackhawk helicopter. As a classical version of the “National Anthem” began a jumper exited soon joined by three others trailing smoke as they twisted and turned on the thermals. Their parachutes opened and team leader Keith Walter who was flying the Stars and Stripes on his rig proudly landed back on terra firma just as the song concluded. The timing was perfect and it was a fine start to begin the day’s packed itinerary. 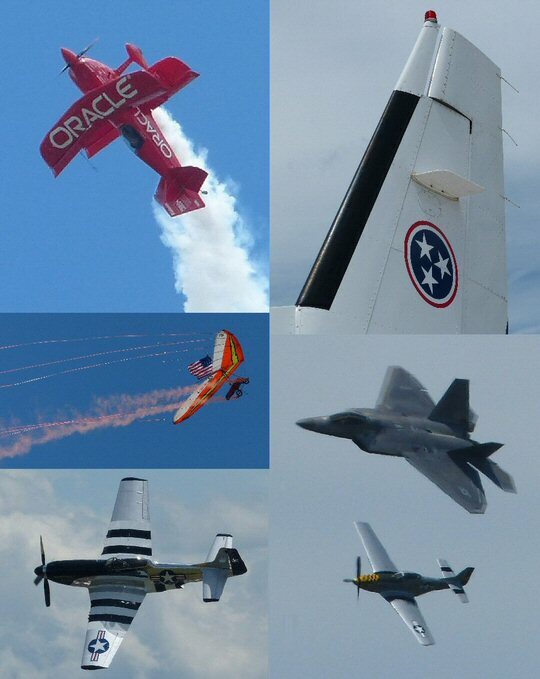 High-flying hijinks at the Great Tennessee Air Show. In addition to the somber tribute for the Fallen Angel there were plenty of uplifting stories as well. Take the case of Sean D. Tucker for instance. This longtime pilot for the one-of-a-kind Oracle acrobatic airplane was once afraid of flying. It was only his attendance at an air show in his youth that lit the fire in him to take to the skies to overcome his fear. The only fear left now is the shock, awe and concern from the participants on the ground as he ran through an array of mind-blowing tricks and maneuvers during his two-performances on Sunday including an impressive low-flying three ribbon cut as his grand finale. Another inspirational story was provided by Dan Buchanan who lost his ability to walk during a recreational vehicle accident. But, that didn’t stop him from becoming one of the world’s most sought after hang-gliding pilots who navigated his colorful craft safely to ground but not before setting off some pyrotechnics to punctuate his performance. It was said by the announcer that when Dan’s not flying he enjoys high-speed long distance desert riding and racing on ATV’s, flat-water river kayaking and SCUBA diving on wrecks and in caves. Clearly this high-flyer show no signs of slowing down. These two pilots underscored the organizer’s considered decision to carry on in the wake of losing Capt. Kuss earlier in the week. During several tributes throughout the day it was emphasized that these large gatherings of mighty men and impressive machine are organized with the implicit purpose of inspiring the next generation of advanced flying aviators. 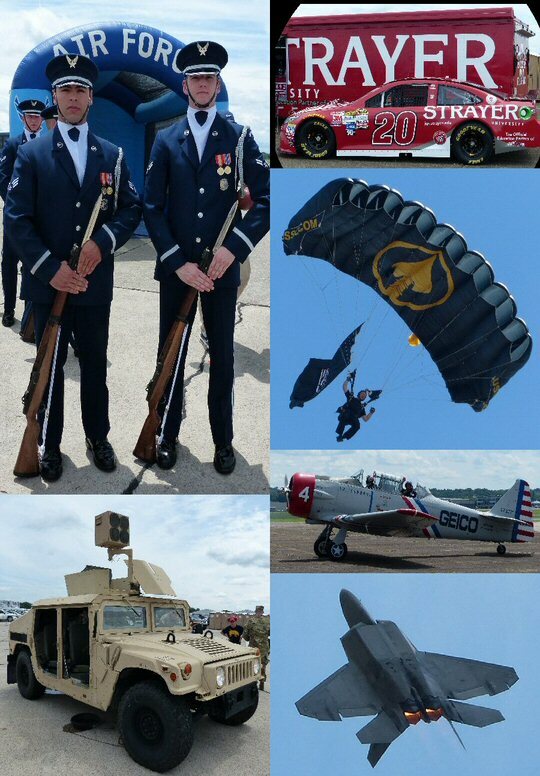 The Great Tennessee Air Show was a family-friendly event and there were hundreds of potential new pilots roaming the tarmac with their parents in tow. There were many exciting static displays and aerial acrobatics to be seen. For fans who love to keep their feet on the ground there was plenty of activities set up on the airstrip. There were rides for kids and adults including a space-shuttle themed bounce house and rock climbing. You couldn’t miss the over two dozens planes set-up to see and feel including the experimental Long-EZ. Kids could climb on a Bradley Tank or a HiMars mobile rocket launcher. Recruiters from all branches of the military were on hand as events like this tend to bring out the patriotic in all of us. A long day in the sun can make you hungry and there was plenty of food options from caramel corn to barbecue to satisfy the culinary senses. Other show-stopping highlights for us included the rambunctious flight of the U.S. Air Force F-22 Raptor known as the world’s most advanced fighter aircraft. Its performance is one of the most sought-after demonstrations on the air show circuit and it thrilled especially when it passed by at top-speed with afterburners on and rock music blaring in the background. 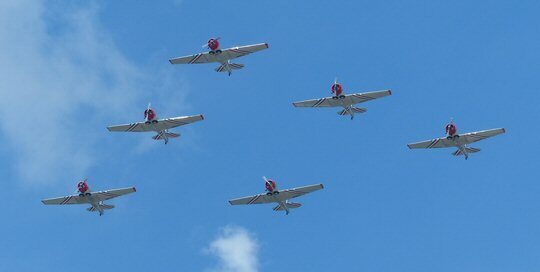 The Geico Skytypers were a team of six vintage planes performing precision maneuvers together or in group formations. They exhibited a number of real life training scenarios that pilots might encounter on the battlefield to appreciative ovation. A large crowd gathered for the beloved biennial event in Smyrna. 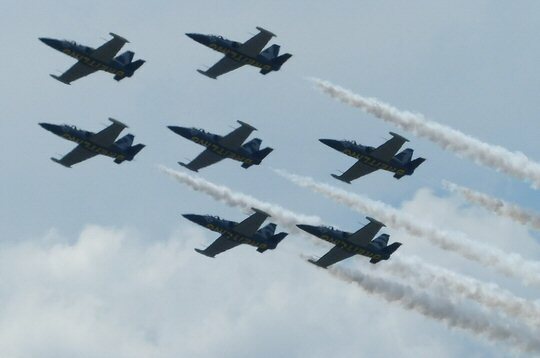 The Breitling Jet Team closed out the day in place of the Blue Angles and the world’s largest professional civilian flight team proved worthy of the headlining spot. The group based out of Dijon, France is currently in the midst of their second 14-city tour of North America in the last two years. 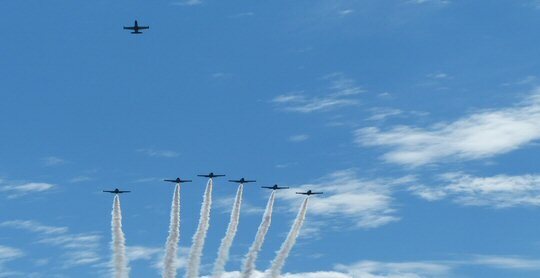 They fly demonstrations that include formation flying, opposition passes, solo routines, and synchronized maneuvers. They closed out the this year’s Great Tennessee Air Show with a moving and emotional “Missing Man Formation” for their fallen comrade that sent the crowd home with tears in their eyes. The Great Tennessee Air Show made the correct choice in carrying on to fly in memory of their Fallen Angel, Capt. Jeff Kuss. The ample tributes and solemn remembrance helped in the healing as local residents and the aviation community mourned their brethren from the Blue Angels. The organizers now have twenty-four months to plan for their next biennial event in 2018 even as they lifted up the life and unfortunate loss of one of their own this year. The Brietling Jet Team honored Capt. Kuss with the Missing Man Formation.